In my first “fact check” of Dr. Ray Peat, I had discussed the mechanisms by which insulin exerts its effects from the conventional textbook point-of-view. I’ve gotten mostly good feedback on that post, and some idiotic ones, from the people who obviously didn’t take the time to read it, or if they did failed to understand it. Briefly, the conventional view is that insulin, upon being secreted by the β-cells of the pancreatic islets, acts on and activates the insulin receptors, initiating the insulin-signaling cascade. This activation of the insulin receptor then provides a docking site for the insulin receptor substrate (IRS) proteins, which thereafter activate kinases in the vicinity that contain a specific SH2 domain, namely the kinase that phosphorylates the 3-position of the membrane lipid phosphatidylinositol 4,5-bisphosphate (PI 3,4 P2) to phosphatidylinositol 3,4,5-trisphosphate (PI 3,4,5 P3). Figure 1 Insulin signaling pathways in the cell. This lipid product, PI 3,4,5 P3 thereafter activates the kinase, PDK1, and PDK1 phosphorylates and activates Akt, another kinase that moves throughout the cell’s cytoplasm, executing most of insulin’s actions, the most important of which for this post is the translocation of the glucose transporters from the cytoplasm to the plasma membrane. This complex insulin-signaling cascade, which I’ve simplified a great deal, is obviously dependent on an intact plasma membrane that’s impermeable (or semi-permeable) to glucose, as well as glucose transporter proteins that are ready to be called into action at a moment’s notice. (Others like Roden et al. have even gone as far as to suggest that the passage of glucose through the plasma membrane is, inherently, the rate limiting step in the use of glucose [Roden, 2004].) There are a few issues with this scheme. For one, in the absence of insulin, glucose freely passes through the plasma membrane and into the cell’s cytoplasm, such that at equilibrium, the glucose concentration inside the cell is 20 to 30 percent of the glucose concentration in the blood (Randle & Smith, 1958a, 1958b). Two, the evidence that there’s a defect of sorts in the glucose transporters in diabetes is conspicuously sparse. And three, glycogen tends to accumulate in insulin resistant tissues, indicating a block on glucose use downstream of the glucose phosphorylation step upon arrival into the cell by way of the previously mentioned glucose transporters (Sakamoto & Holman, 2008). So the impairment of glucose use is taking place inside the cell, rather than at its border, in which the glycolytic enzymes operate. Dr. Gilbert Ling believes, and has shown in a series of experiments in the 1950s and 1960s, that the rate at which glucose moves into the cell’s watery interior is governed by the availability of glucose “adsorption sites” on certain proteins and enzymes. The plasma membrane has little to nothing to do with this process. Insulin, in Dr. Ling’s sense, functions a an cardinal adsorbent, which is basically any substance (e.g., hormones and drugs) that interacts strongly with proteins at very low doses (i.e., potent), changing the protein’s electronic state; this electronic perturbation, so to speak, in turn is transmitted like dominoes to the rest of the protein and other proteins. The proteins unfold a bit as a result, exposing their glucose adsorption sites, which preferentially bind glucose over other sugars, in a stereoselective manner. In the resting living state where, like in prepared Jello-O, water is structured in close association with cellular proteins, as well as ions and other molecules (e.g., potassium and ATP), and so glucose has a reduced solvency in the water inside the cell than in the water outside the cell. Figure 2 Ling's association-induction hypothesis. The figure on the right represents the resting living state and the one on the left, the active living state. The squiggly lines are single protein molecules, X+ is potassium, and Z could be insulin in this case. So in the resting living state, and in the absence of insulin, in which the glucose adsorption sites become unexposed, glucose is found at higher concentrations in the blood than in the cell’s cytoplasm and adsorbed to intracellular proteins and enzymes. This accounts for the unequal distribution of glucose across the plasma membrane (at least 4.5-fold higher concentrations outside the cell than inside the cell). No pumps or transporters are required. Insulin, glucose, and oxygen are at the core of our resistance to stress, as Danny Roddy has pointed out, and now we have a firmer basis for understanding why this is. Take for example what would happen, in terms of Dr. Ling’s association-induction hypothesis, in ischemia (low oxygen availability) of the heart, which represents an extreme case that offers up a glimpse of the provision of support by oxygen, glucose, insulin, and carbon dioxide. Oxygen is depleted as the cell becomes increasingly reliant on the use of fatty acids to generate ATP, accelerating the build up of lactate. 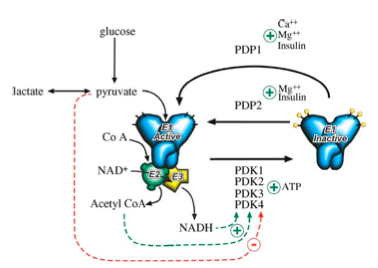 At the same time, the flux of glucose through the pyruvate dehydrogenase enzyme (PDH) complex, which carries out a key step in the metabolism of carbohydrates, essentially linking glycolysis to the citric acid cycle, 2 slows, and ultimately comes to a stop, further contributing to lactate buildup. 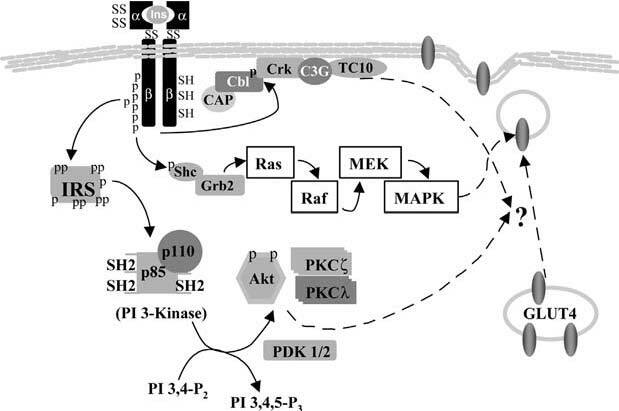 Figure 3 PDH complex (blue) regulation via reversible phosphorylation (inactive, right) and dephosphorylation (active, left) by kinases (PDK 1,2,3, or 4) and phosphatases (PDP 1 or 2). Recall that fructose is one of the activators of the PDH complex. The buildup of toxic metabolites and the loss in cell structure leads to an impaired functioning of tissues and their death quickly ensues. The provision of glucose, oxygen, and insulin, however, can short-circuit and reverse this vicious cycle. The oral hypoglycemic drugs, like glipizide, are associated with an increased risk of cardiovascular death. This warning was first made based on a long-term prospective study which was set up to evaluate the efficacy of four different (non-insulin) classes of oral diabetes drugs in the 1970s that included over 800 diabetics. The persistent warped view of diabetes—that is, it is a disease of excessive blood sugar—has made it possible to continue the practice of treating diabetics for the sole purpose of "controlling blood glucose levels." I’ve for the purpose of keeping this discussion as reader friendly and short as possible, simplified concepts as much as I could and left out the details, calculations, experiments that have led to some of the assumptions made herein. I’ve also in this discussion left out the role of hormones, which adds another layer of complexity to the entire picture. Thinking about physiology in terms of Dr. Ling’s conception of everything is hard to do (at least for me) and I’ve seen others try, but whether they realize it or not, they’ve oscillated back and forth between Dr. Ling’s model and the conventional model. Nonetheless the argument of "context" is not applicable to my first "fact check" where I challenged Dr. Peat's position regarding the role insulin assumes in the blood glucose regulation. Much of the work cited in defense of Dr. Peat is not only difficult to track down, but they can also by difficult to grasp and can be, at times, obscure to my conventionally-educated scientific mind. Yet, my position regarding Dr. Peat's quote on the role of insulin in the post I've been alluding to hasn't been successfully refuted, even given Dr. Ling's conception of cell physiology, but I'm still interested in having a thoughtful discussion about it in the comments section. 1 others in the field have confirmed this quality of cellular water. 2 PDH complex carries out the metabolism of pyruvate to acetyl CoA, a central point in all of metabolism that intertwines the oxidation of protein, fat, and carbohydrate.